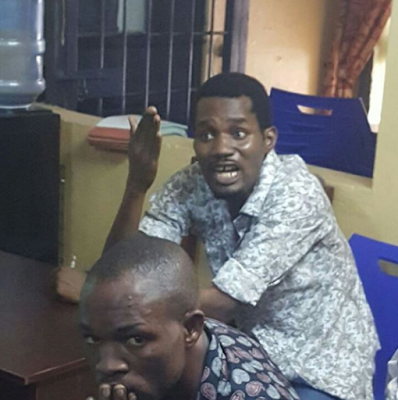 Nigerian actor and director, Seun Egbegbe who was allegedly caught some months ago for trying to steal Iphones has been caught once again for trying to steal about 10 million naira from a mallam at the Gbagada teaching hospital. Toyin Aimakhu's ex-boyfriend, Seun Egbegbe is in the news for the wrong reasons again. According to reports and a video being shared online at this moment, Egbegbe was caught trying to rip off an unsuspecting mallam of the sum of 10 million naira today, while pretending to be a medical doctor at Gbagada General hospital. This is surely getting out of hand as this will be the 2nd occurrence in less than 6 months. Something should be done about this guy before he ends up being lynched as he seems to be getting lucky. We are waiting for his fans to come and say this is not Seun Egbegbe, that he is chilling in Dubai. Is he a thief through birth? I'm sad for him, he's such a disgrace to his family and fans if this is true, he needs help. This guy again? Dem swear for am? Kai, there's no doubt that this guy is a thief. Only God knows who this guy has offended. This curse is strong. He thinks his juju dey work, but kole werk. They should just hang tire for this guy's neck n let us rest. When, where and how did it happen. That's what they call details in journalism. He must be a kleptomaniac, no doubt. Seun E GBE GBE ! Is like the swear for this man with stealing. Abi him juju no dey work again? what kinda nonesense iss this!!! Actor, Nonso Diobi Involved In Accident / Investor BJ Flaunts Gold Chain: ''Wears Full Duplex On His Neck" / Kemi Olunloyo: "My Father Was A Ritualist, Adeboye & Oyedepo Were Drug Dealers"